That night I made a salad for dinner, (Chicken ala taco seasoning, peppers, corn, lettuce, tomatoes, olives, carrots, kidney beans, crushed corn chips...), all tossed together. My daughter usually will pick the olives out and one or two other things that suit her fancy, and simply just won't eat much, and then sneak in and make herself a peanut butter & big mess sandwich later on. Well instead of just putting a pile of salad on her plate that night, I organized it, neatly. She ate it all. Now the other kids want theirs the same way. And to get to the point... Today we were at the grocery store and all of a sudden my son said "Look! Beaver eggs!" I looked and beheld...chicken eggs... I was busy trying to keep all 4 kids in sight and figure out which yoghurt really cost less... 10 for $4, or 10 for $6 (math is really hard when the kids are running wild in grocery store) My son exclaimed again "Beaver eggs!" This time I looked where he was pointing, up above the eggs high on the wall in huge letters it read "Beverages." The end. would have played in the air! you have eaten them all! you don’t want it at all. this poop is all BLUE! To the bath with you child! I need some hot water! And got stung, by a bee. You know in that movie Signs, how the kid leaves glasses of water all over the place? Well our kids do the same thing. They fill a cup of water up, drink a little and save the rest for later. Later, when they are thirsty they get another cup and do the same thing all over again. Thus our kitchen is booby trapped. Well, today I was summoned to the kitchen by my crying baby, who I found crawling in a puddle of water. It was also all over her back and head and face. I figured she had pulled a cup of neglected water onto her head, as she has done this before. Laughingly and soothingly I picked her up, not worried about getting wet too, it's summer, it'll dry. She grabbed at my face with her wet hands and I wiped the drips out of her face with my shirt. As I did this I was looking around for the cup that had once contained the water, there was one on the table that was empty except for a drop or two proving that it had recently held water, but it was too high for the baby to reach... At the same time I observed my 2 (almost 3) year old walking down the hall trying to put on a new dress. "Mom, I peed." Ewwww. I proceeded directly to the bath. Funny huh? Not the end of the story. There is a happy ending. After the bath I tackled the cleaning of the floor. The 2 year old wanted to mop too so I gave her a turn and told her to clean up her pee. She happily took the mop and headed to another section of the kitchen. Much to my delight there was a puddle of pee over there! I was very happy to know that my baby had not been peed on and had not wiped it on my face! It had really been water all along. And to settle the mystery as to where the water came from... I questioned my daughter a little more and found out that she had dumped a cup of water on her baby sister. Yup because that is just the kind of kid she is, the kind that will randomly dump water on someone to see what happens. I'm sure she was less than happy to see that it didn't cause the baby to melt into a sizzling pile of goo. Maybe I should ask her where the missing hen is. Many of you have probably been wondering if my 2.5 years of higher education was beneficial to me in my chosen vocation as a stay at home mom. I can now definitively tell you that it was. 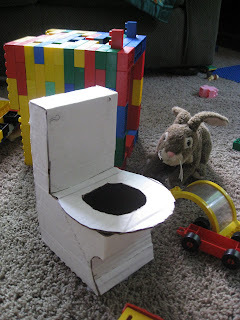 Through the process of designing and developing this bunny's potty I called directly upon the skills learned in my Design Theory class, Art 101, and one of my interior design studio classes. Granted, in school I would have stayed up till 4 in the morning to finish such a project as this. Real life has certainly improved my time-efficiency. This beauty took all of about 10 minutes to make! And for my mother, here is a shot of the back of my girls heads. It's also proof that I brushed their hair once. I want to do things and create things, but that would complicate life and there is no way I could complete anything right now. So I content myself with moving the furniture around every couple of weeks. 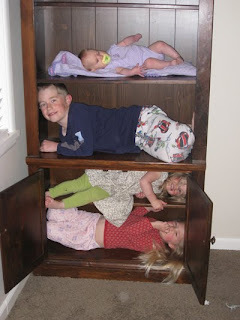 I was moving a bookcase the other day and the kids all piled in. What I really want to do is get rid of most of the furniture and paint all the rest black or white. I can't decide. What do you think? Black or white book shelves? And while I'm at it I think I'll cut my hair really short.